Before I start this review I want to confess that I’ve never seen the movie or read the book as I thought it would be too scary for me. (I’m really not a fan of the horror/thriller genre.) I remember the uproar when it was announced that American Psycho was going to be reimagined as a musical for the West End and laughed it off as something I would never see. Then it was announced that Matt Smith would play the lead character of Patrick Bateman so I bought tickets as soon as they went on sale. Yes, I’m fickle. Deal with it 😛 Tickets sold out really quickly but thanks to the Almeida website listing the last performance of the year as a special event rather than with the rest of the block I was able to secure two seats in the stalls for only £20 each. Score! 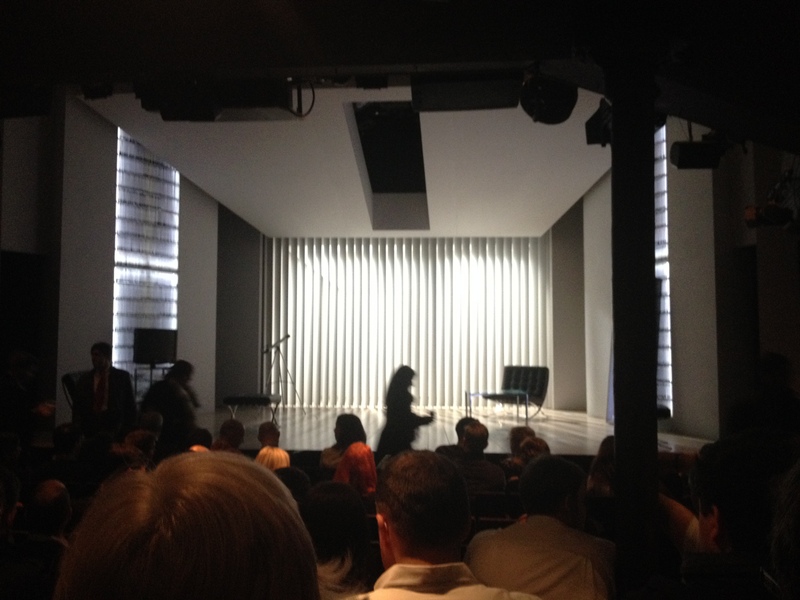 The Almeida theatre is a little off the beaten track in Islington, somewhere I’ve not really been before. After a lovely dinner at a nearby Italian restaurant Matt and I headed to the theatre to take our seats. I was a bit worried right up until the last second that we were going to find out that Matt Smith was going to be replaced by an understudy due to it being New Years Eve but he rose up on to the stage in his tighty whiteys as the chorus stood interspersed the audience singing and my fears were alleviated. Having not seen the movie I was a little unprepared for that moment. I was also unprepared for the fact that Matt Smith can sing. I mean it was a musical sure but he was really great. The stage set up was amazing and worked perfectly for each of the many “locations” needed, very cleverly done indeed. I won’t give away any of the plot but it was funny and clever and frustrating. The music/lyrics were brilliant, in particular the songs about business cards and what the ladies were planning to wear to Patrick’s birthday party stand out in my memory. While Matt Smith was amazing it was his co-star Cassandra Compton as Jean who really blew me away. That voice! It just gave me shivers. The audience gave the show a standing ovation and Matt wished us all a happy new year before exiting stage left. After the show the atrium was still quite busy with people. Some were staying to enjoy the NYE festivities the Almeida were putting on while others were hanging about hoping to get autographs/photos with the cast. Matt and I opted not to hang about given that it was new year and instead went to brave the fireworks over the Thames (which we actually never saw in the end as it was just too busy!) It was, unexpectedly, a thoroughly enjoyable show which kept me gripped throughout and I look forward to watching the movie version which has luckily just been added to the Netflix lineup!